IHSAHN comes from Notodden, Norway, where he at the age of 13 started playing in what developed into one of the world’s most influential black metal bands, EMPEROR. At only 17 he recorded and performed “In the Nightside Eclipse”, which has been many times over voted one of the top metal albums of all time. Since then, IHSAHN has divided his time between the metal and avant-garde worlds in projects like EMPEROR, THOU SHALT SUFFER, PECCATUM, HARDINGROCK and last but not least his ongoing solo vessel IHSAHN. In addition to his work as a musician, he teaches guitar, writes columns for Guitar world and is together with partner Heidi S. Tveitan running Mnemosyne Productions and Symphonique studio. “’Amr” is his seventh full-length release, and contains nine tracks. “Lend me the Eyes of the Millenia” features some dark electronica and extended harsh vocal screams. His vocals have always been unique and that is still the case here. Drums rumble deep throughout, driving this machine of war. The crescendo of structured madness taking the song to completion is absolutely vibrant. “Arcana Imperii” features a staccato guitar and bass attack with varied vocal styles. The clean vocal harmonies are quite alluring and shift the song in and out of the light. The balance between the two is exquisite, though it bites back a bit at the end. “Samr” is a mid-tempo song brooding with a somber tone and speaking often of “emptiness.” It’s one of more accessible songs on the album for sure…tender and expressive and with unabashed melodies. He also lays down a very memorable guitar solo. “One Less Enemy” goes the opposite direction, with some murky overtones and some menacing guitar chords. The vocals are harsh and penetrating, and the music is sinister and threatening. The clean vocal however douse some of the sharpness with streams of harmonies. “Where you are Lost and I Belong” is more pensive and thoughtful, drawing out its sound with melancholy clean vocals and a slower pace. It sways gently at times, with soft flute notes. But lurking in the background is always this feeling of anxiety that something moves in the shadows. “In Rites of Passage” is another gloomy and sometimes angry offering, fueled by a choppy guitar riff and some murky electronics. However, it breathes at times with dual guitar harmonies and clean vocals that cut some of the edge. “Marble Soul” is a bit of a peculiar track in that the chord progressions venture into their own territory at times and leave you with the feeling of being unsure where things are heading. Sometimes rabid and other times free, it is perhaps the most intriguing song on the album in that regard. “Twin Black Angels” has soft keyboard notes and a pretty little guitar riff, in a complete and direct tie in with the influences of the 80’s sound in his music. The chorus is high in melody and the guitar solo follows that line very well. But he digs deep with rage in a quick harsh vocal passage as well. “Wake” closes the album in a more traditional snarl. It is amazing how he is able to segue a darker more aggressive passage with a melodic chorus that shines above like a bright beacon in the night sky. It’s my favorite song on the album for that very reason. On “Amr,” expect a more succinct and eclectic mix of music that really runs the gamut in an explorative method. Some might say that it lacks a core identity. 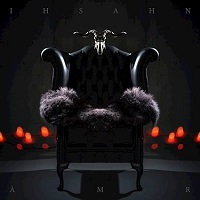 But to anyone who understands Ihsahn’s roots and longing to make deeply personal music, it is exactly this exploratory and at times surprising method of songwriting that makes the album as distinguished as it is.